I've been musing more on the interface of choice and predictability. Experiment has shown that our choices are much more determined and limited than we tend to feel, and that many are made unconsciously even when we think they are conscious. Experiment has also shown that nearly all (perhaps all) motivation is emotional, and that reason follows after. Experiment has also shown the physical universe to be very nearly deterministic. Even seemingly random quantum events (which the Free Will Theorem suggests may be arbitrarily chosen rather than random) don't change deterministic outcomes on almost anything (and maybe nothing) by the time you get to the level of just a few atoms interacting. The realms in which quantum events play a significant, unpredictable role are tiny even compared to our brain cells. So it seems within grasp to understand living things as deterministic systems. Very complex, yes, but still predictable (at least in aggregate, if not individually). Lee Smolin has suggested that the choice being made by matter is to copy other, similar matter, thus resulting in very nearly deterministic laws. The only time truly new and unique choices will be made is when a system doesn't have a sufficiently similar system to copy, and in our vast universe such systems are vanishingly rare, since so many things can be explained through reintegrated, reductionist models. The only ones that may be amenable to experiment are new, quantum entangled systems that we may be able to artificially create with big physics in the future (I don't really understand what this means, either, but it does suggest that nothing we experience day to day falls in this category of the untested). I can't tell what all this means. Can a system become un-predetermined simply by being complex enough? Hydrogen atoms copy hydrogen atoms, water molecules other water molecules, proteins other proteins because the atoms making the proteins are copying similar atoms, and that continues to larger structures giving us the laws of nature that we observe. This predictability isn't because Free Will is absent, but because everything is exercising its Free Will to be a copy cat. If matter hadn't long ago decided to follow this course and stick with it there would be no coherence to any structures or laws. So in some sense matter doesn't have another viable choice, but we know of people who choose dissolution and destruction all the time, so other stuff existing that never chose to be a copycat is plausible to me. But does the emergence of new interactions and relationships among the parts result in limited amounts of unpredictability? Even though the only truly unique quantum events may be in rare, not yet attempted quantum entangled states, and seeming randomness has no effect even at the size of mechanisms sending messages in our brains, is there a level of complexity at which we begin to face real, unpredictable choices? Remember, I'm not arguing that choices only happen at certain unique points in time and space, the way we are typically inclined to think of and talk about Free Will. Choices are going on constantly and everywhere, but most of them are simply the choice to relate and continue to exist as coherent structures. Is there a complexity point at which choices qualitatively shift and turn into what we more typically think of as Free Will, conscious choice, or agency? I don't think this is a stupid question. Even as I attribute choice to everything that exists, I don't imagine that Pluto has much agency in the typical sense. Biology and computer science are continually probing the boundaries between consciousness, conscience, choice, instinct, programming, and other traits we readily use to differentiate between human, animal, and robot, and trends seem to point toward "human" characteristics as emerging from simpler characteristics as complexity increases. Intelligence and self-awareness are neither a perfect continuum from "pure instinct" to rationality, nor are they an inexplicable step. Qualities may be absent until several simpler qualities come together in a relationship, so there is a true condition of presence versus absence, but we can understand many of the relationships and use them to explain the origins of the new qualities. If there is such a level of complexity, is it meaningful in our daily lives, or is it a level so much greater than human complexity that we are, for all intents and purposes, living determined lives? I reject a purely deterministic universe quite confidently, but still wonder if we manage to escape determinism. Is the community of Gods sufficiently complex that they escape total determinism, but we are not? Are the choices of Gods only not predetermined when they make choices that involve new and unique quantum states? Is our future only not predetermined when we interact with Gods based on rare non-predetermined quantum events? I don't think so. I suspect if we could quantify it we would find that the "choice threshold"--the level at which new, unique, only partially predetermined events happen at semi-frequent intervals--happens at approximately human complexity. We should be right at the low end of how frequently we have to deal with such choices. That's my guess. Wish I knew how to model it. If these assumptions are correct, we should expect artificial intelligence to become "human" for all intents and purposes when it attains the right kind of complexity. 1. Matter searches the entirety of existence space and behaves as other sufficiently similar matter has in sufficiently similar situations. 2. Matter interacts with nearest neighbor matter by a different set of rules. 3. This different set of rules should arise because of shutting down connections between certain bits of matter until connections are limited to three dimensions. 4. Time is real (although it appears to be malleable or warped through interactions in space dictated by nearest neighbor relationships). Does someone want to try to build a new "Game of Life" and try to make "laws" emerge out of some form of these "meta-laws"? "Therefore when Tao is lost, there is goodness. It is the beginning of folly." What should we really expect from prophets? If God understands that knowledge of the future is the beginning of folly, and knowledge of the past is over and done, do we expect God to teach us folly? Do we expect God to speak truth, the whole truth, and nothing but the truth, even though we know our language and comprehension are incapable of encompassing that? I have personally come to expect God to be good and loving. Being good and loving means being effective in raising us to Godhood, and Godhood is a process and a community. It is not a state of absolute being, or absolute knowledge, or absolute truth. It is a process of doing the best thing we know to do, right now. Frankly, I'm terrible at living in the now. I believe detailed understanding of the past and accurate predictions of the future are essential to making the best decisions we can about the present, but part of me tells me that isn't always true. It's really enough to simply have whatever stimuli will help us make the most effective, Godward decisions in this moment, then the next, then the next. Of course, a sustained sequence of effective choices in the now requires a certain amount of "true" understanding of past and future, but not an infinite amount. So are we really wise in asking our prophets to prophesy? Are we really wise in requiring that they have a perfect understanding of history? I'll give my answer--it's complicated. We are wisest to expect prophets to be human. We are wisest to seek their counsel for today. We are wise to realize that we aren't the exception to most rules, but every one of us is the exception to some rules. We are wise to seek and grow and listen and trust and pray and reason enough that we can learn our personal place in this unique life, and to choose now the best we know how. We are wise to learn that no one else can tell us what that place is, especially as we grow older and add years of complexities to the sum of our experience. We are wise to hope that others--including our prophets--are doing the same. We are wise to humbly counsel with others who likely see beyond our narrow view. We are wise to pattern our lives after our heroes. We are wise to give our heroes a soft place to fall. This is what I tell myself, today. This post might be a little bit lazy, but I want to outline the main points while they are in my head. It appears that three, non-peer reviewed studies (although the results should be relatively "easy" to reproduce) have been done on the Urantia Book regarding distinguishing multiple authors. As a very brief summary, the Urantia Book is claimed to have come from divine beings that dictated their messages through a human mouthpiece. With the history of the book claiming many original authors and one (or perhaps two) dictators, it presents very similar stylometric claims to the Book of Mormon. We've seen how several different studies, including some using the most exacting and revealing criteria, reveal multiple authorship for the Book of Mormon. If the Urantia Book shows the same features when faced with the same scrutiny, then in my mind the result would favor the hypotheses that the Book of Mormon was channeled, revealed, or invented by Joseph Smith rather than translated from ancient writings. It wouldn't technically contradict certain forms of the "translation" hypothesis, but it would weaken the hypothesis that I favor; namely, that there really were texts written by ancient authors and that Joseph transmitted them as faithfully as he was able into English. He thus preserved some evidence of different modes of speech among the original authors, while shaping the text into his 19th century, pseudo-biblical language for the sake of communicating the message most effectively. Two of the studies on the Urantia Book are only easily available in summary form as published in newsletters and on the Urantia Book website. The third study examined the Urantia Book using the Delta method employed by Jockers and coworkers as part of their examination of the Book of Mormon, and was performed by a Latter-day Saint rather than a follower of Urantia. I'm just going to summarize what I see as the most telling points of "Who Wrote the Urantia Papers?" Analyses of non-contextual function words and their usage are able to distinguish among at least 5 narrators and potentially 9 with high degrees of certainty. None of the Urantia Papers are in the normal writing style of one proposed 20th century author. Writing sample sizes are mostly large enough to give statistical confidence as long as application of the statistical tests is deemed justified. Each of 8 authors with sufficient papers for testing was statistically identifiable. 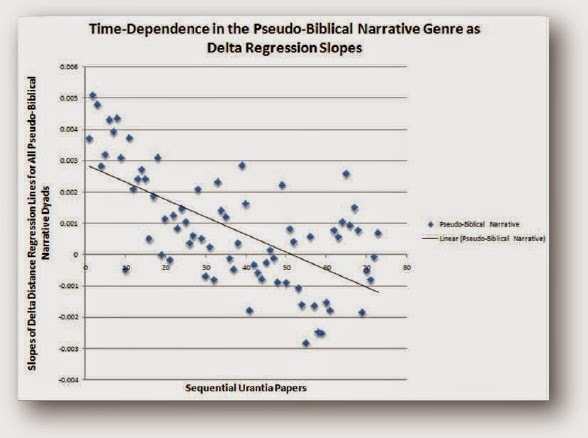 When tested against a few 20th century human authors, the styles of the Urantia Papers were matched mostly with control authors who were in no way connected with their production (Freud and Mr. Smith). 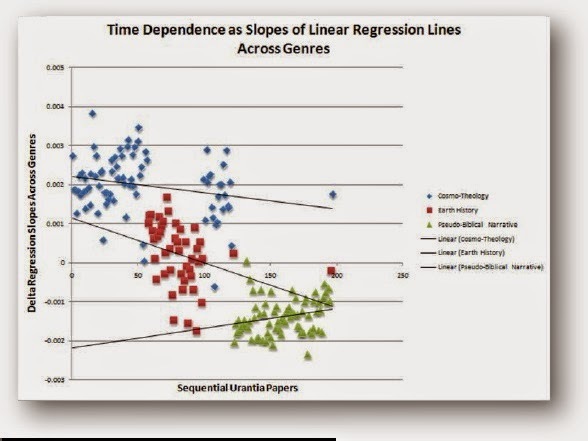 In each case the style within the genre is more uniform than the style between genres, and the style changes linearly with time. 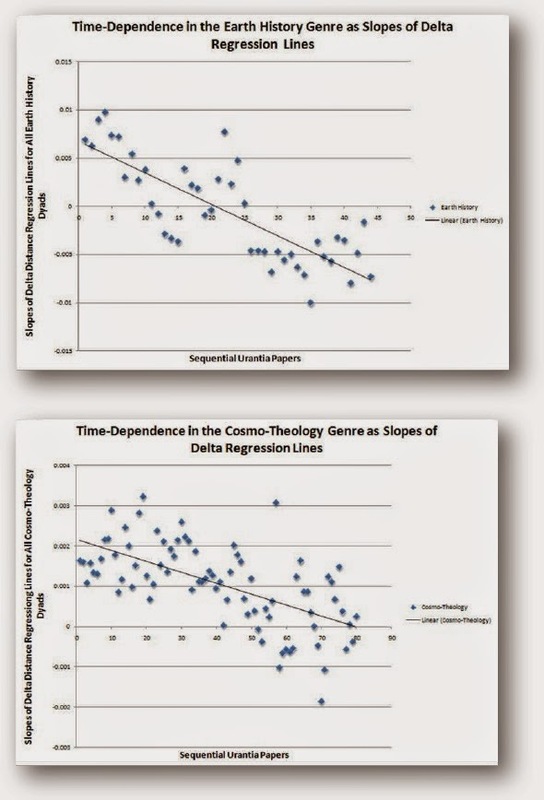 The conclusions strictly dictated by these data seem to be that function word stylometry reveals three genres, and doesn't lead to any strong conclusions regarding the number of authors within each genre. So from evidence of eight or more authors, we are reduced to evidence consistent with one single author changing his style over genres and time--both phenomena that we have seen before with Joanna Southcott and Sidney Rigdon. Could a Single Author Produce the Variety of Stylometric Features? Complex, unfamiliar topics. Joseph Smith is reported to have told stories about some topics treated in the Book of Mormon, but had not previously written anything of significant length. Complex topics of unknown familiarity. Saddtler was demonstrably well read and previously or simultaneously wrote on several topics related to the Urantia Book. Written or dictated in short times. No time available for significant, subconscious shifts in authorial style. Written in unknown amounts of time (possibly short), but over many years, thus allowing for observed linear shifts in authorial style. Less rich vocabulary in Mormon scripture than in Joseph Smith's personal papers. Styles changed to match genre, a conscious decision influencing style available even to untrained authors. Saddtler is known to have read and possessed numerous texts on topics treated in the Urantia Book, however the only clear imitation is the Bible, similar to the Book of Mormon. Claimed to be translations, suggesting authorial styles should be preserved. We don't know what to expect stylometrically from revelations from different sources. Genre controlled for in some studies, revealing multiple authorship. Genre controlled for in one study, consistent with single authorship. That's it for now. Out of time. 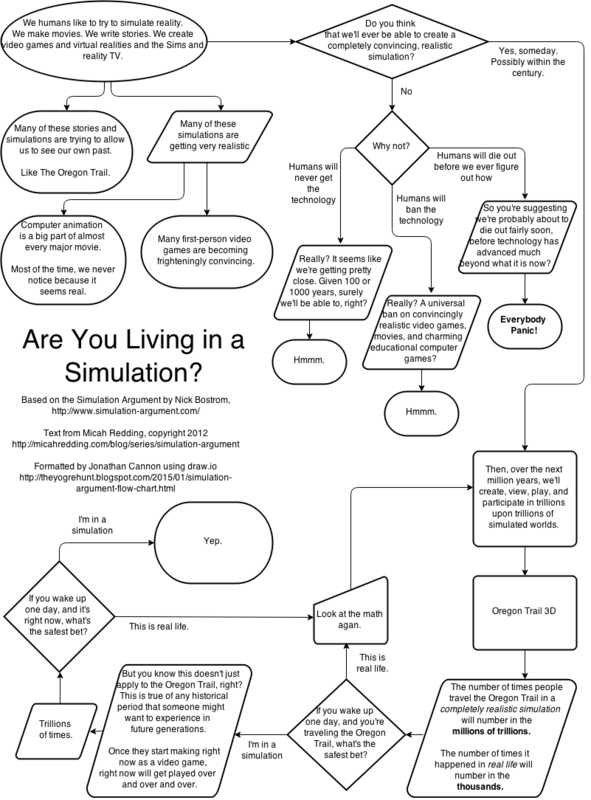 Updated flow chart of possible realities, including some general references and updated annotations. 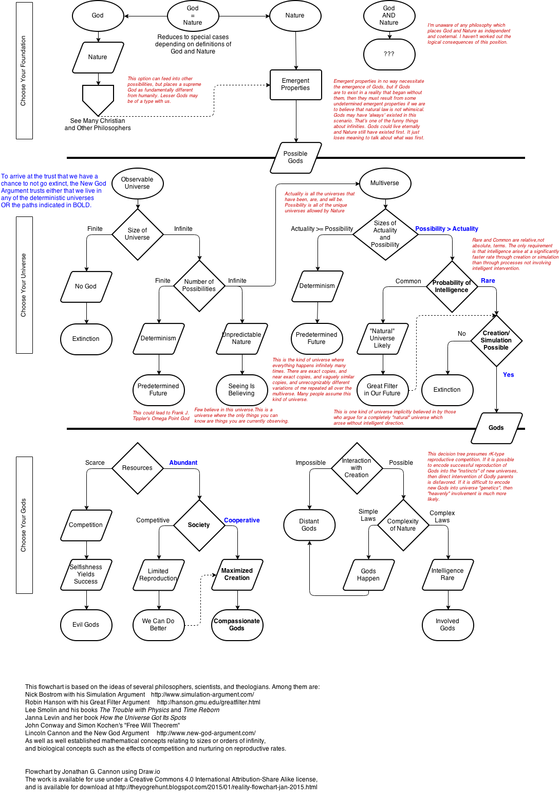 This is a reformatting of Micah Redding's Simulation Argument flow chart. If anyone wishes to modify this document, I will happily send a draw.io file. You may know that I favor arguments about living in a creation over a simulation. I have doubts about technical problems with indefinitely nested simulations, and I have numerous other questions, but I find the argument thought provoking and relevant to the extended creation hypothesis. I'm not sure I have a single friend who likes the devil, but there are two, very different reasons for their dislike. One group hates or fears or shuns the temptations and evil he works in their lives and in the world. The other seems to think the whole idea of a devil is harmful. We blame our own failings, others actions, or even normal things that we happen to dislike, on a being whose power and behavior are at times described in ways inconsistent with the powerful, wise, and loving God we profess belief in. In addition, they argue that the Devil is a late theological development, and prevents some people from taking responsibility for their own moral choices. There are certainly those who fall in between. My dad always said there are three sources of thoughts in our heads--God, Satan, and ourselves. The way my dad lived suggested that we were the biggest source, God should be sought, and the Devil didn't merit much consideration, whether he was speaking or not. My dad has been the biggest influence on my views in this case, but I have to say that I find the figure of Lucifer in the premortal councils very compelling. The tiniest bits of matter said yes, we will join together. They did it by copying each other--the simplest choice that says "I see you"--and as they did new structures arose. In time these structures became universes. Universes formed more universes, or broke apart again into chaos, until intelligent life emerged and began shaping its own future. These intelligences became the Gods, forever alive as all that was since the beginning, but now in new forms--no longer a sea of chaos. Finding great joy in their new knowledge, power, and family, they invited more and more intelligent matter into their family, extending the joy of creation only fully available to self-aware structures, beings who had chosen to be, and chosen to love. In extending the knowledge and power of creation to intelligence that hadn't already gone through the ages long process of finding the love needed for universes, lives, and Gods to flourish, these Gods gave a short-cut to their new children. These children could learn the power of creation, and destruction, without having lived through all the consequences of choosing good and ill. And here we meet Lucifer, Son of the Morning. What do we see? Our glorious, intelligent, good brother Lucifer. The brother who soaked up everything his parent Gods would teach him, and pass it on to us, his adoring siblings, so we could all rejoice in the secrets of being. But there is this nagging hardness in our parents' call to create, reproduce, and love. Not all of us will choose what it takes to become Gods. Some of us will refuse the hard choices. Is there no other way? Lucifer said there was. "Why can't you just make everyone become Gods?" he asked our parents. It doesn't work that way. "Why not? Just because you didn't get where you are without great pain and loss, why do we all have to go through that? We know so much more now. You taught it to us. Why do any of us have to suffer like you did? You've given us all the knowledge to live forever and make new worlds. Why should anyone else have to suffer in the process? Why can't your glory be given to all without passing through the evil? Isn't that what you want? All of existence to be glorified and share in your majesty?" I can imagine these questions pulling at our hearts and our looking at what our Parents had done and wanted us to do, and realizing that it would work. Lucifer's plan would work. Our Parents could bring us to where they are--or very close--without the pain, the loss, the evil. My earthly parents didn't raise no fools, and I find it hard to believe my Heavenly Parents did worse. But Lucifer's plan says, this is enough. We need only get here, no further, and eternal life will be good. It will be enough. We need no more to find eternal joy. But our Parents saw more. They reached their glory through ceaseless striving and boundless loving. They were not at the end of creation, but moving through it headed to a destination even they had not yet fully imagined. The laws of being were not encompassed in their knowledge, but only explored to the horizon, and as each horizon was reached a new one appeared. They had learned to love the journey so fiercely that they wanted all to come see. Come, follow Us. Join Us. Join Us in a quest, not a destination. Help Us find new horizons. Help us understand new laws, since not all the laws of Nature even exist yet. Help us shape the unrealized future. Lucifer's plan could make us Gods, but would damn us at the same time. We would not flow into the unknown future. So some of us stepped forward, understanding--or at least trusting--that there was no other way than to learn of good and evil, life and death, sorrow and joy. Having fallen from grace, Lucifer refused to pass through the pain, but he had no qualms about helping his foolish and trusting siblings to experience it. So he said to Eve, there is no other way. You must learn of evil to become God. And God rebuked Lucifer for tempting Eve. And Lucifer said, "I'm just doing your job. That's what you want. That's what you learned before, and what you taught people on other worlds." And it was true, but our Parents taught with love, Lucifer with spite. Lucifer learned the error of his ways as our Parents let him grow no more. They granted him no more power, having seen how Lucifer would use it to damn all new creation, and for perhaps the first time Lucifer felt misery. But it had been his own choice. It was in him so completely that our Parents could not undo it. They could not make him love agency, so they had to stop his power before he destroyed eternal progression in the name of ending sorrow. He could not become the God he was born to be, or he would destroy countless futures. This sorrow of lost children could not be avoided by our Parents who knew that they could not deny agency--the reality of the very stuff that makes us--and knew that endless joy came only with eternal progression. So Lucifer makes sense to me. I almost certainly don't believe in various absurd things that have been portrayed, like red skin, horns, and a spiked tail, although if Satan wants to look that way, fine with me. I don't picture a hell filled with lava and dark rock, or ever deepening levels of blood and hate. I'm agnostic about a tempter who speaks to our thoughts. I've seen enough of evil people that I find it simple to imagine evil among spirit beings. I also admit it seems to me inconsistent to believe that God can speak to our spirits, however you interpret spirit, and not allow the possibility that other unseen beings can also speak to us. I'm sure some of my acquaintance say none of it is from unseen beings, but I've already given my reasons for finding that improbable, pessimistic, or a concession that the future is completely determined and all meaning is finite. The Lucifer that makes sense to me saw a real, possible future where pain and sorrow were absent. He only failed to believe that Joy (like work) is not a state. Joy is inseparable from process and is meaningless without change. He mistook the passing state of our Parents as an end, or at least convinced himself that such a state would be a sufficient end. I'll admit, this Lucifer makes less sense in the presence of an all-knowing God who understands every law of Nature and can predict the entire future. In this heaven, Lucifer and a third of our brothers and sisters would have to be truly foolish or wilfully rebellious with no hope of success. On the other hand, in a world where our Parents could share all Their understanding except for Their experience, in a world where the laws of Nature are emerging and even being shaped by the intelligences within, I can see Lucifer saying, "Look, I've done the calculations. This would work based on the very knowledge you have given us." Lucifer simply extrapolated to one of the possible futures. That it was a future without a future didn't matter. That Lucifer would be choosing a state and not a process, would be limiting agency, would be limiting reproductive rates, and might be limiting the amount of intelligent stuff that could be invited towards Godhood didn't matter. Suffering and pain would be avoided. His power, and maybe ours too, would be assured. But our Parents had evolved into and chosen an open future. An unknown future where agency had full reign. A world where every being willing to join it would be enabled to maximize our potential. A world where joy and sorrow coexist and are found in becoming, not in being. A world of hope and great knowledge, but not of certainty. Never of complete certainty. A world where perfection is not a state to be achieved, but an undertaking possible in the now but never finished. And true love means not letting Lucifer or anyone else stop this journey, even as it breaks our Parents' hearts to watch them choose an end to their growth, and forever will.